When I was a preschool teacher, I found that my set of rough rare earth magnets were among the kids’ favorite toys. However, management got jittery after those kids ate some elsewhere in the states. 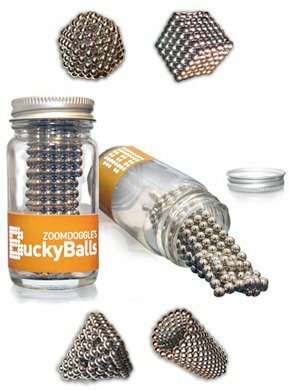 I can understand why these Bucky Balls are not for kids — the tiny magnets look eminently swallowable. But damn do they look fun. I can’t imagine that they’d stay in those perfect patterns for long in my hands, but who cares? You can get them for $25 over here at BustedTees. There’s also a nice demo video. Seriously, though, kids will think it’s candy so don’t give it to them.